A Subedar in the the Burmese Military Police who was born in Aklia Jalal in the district of Patiala, East Punjab. 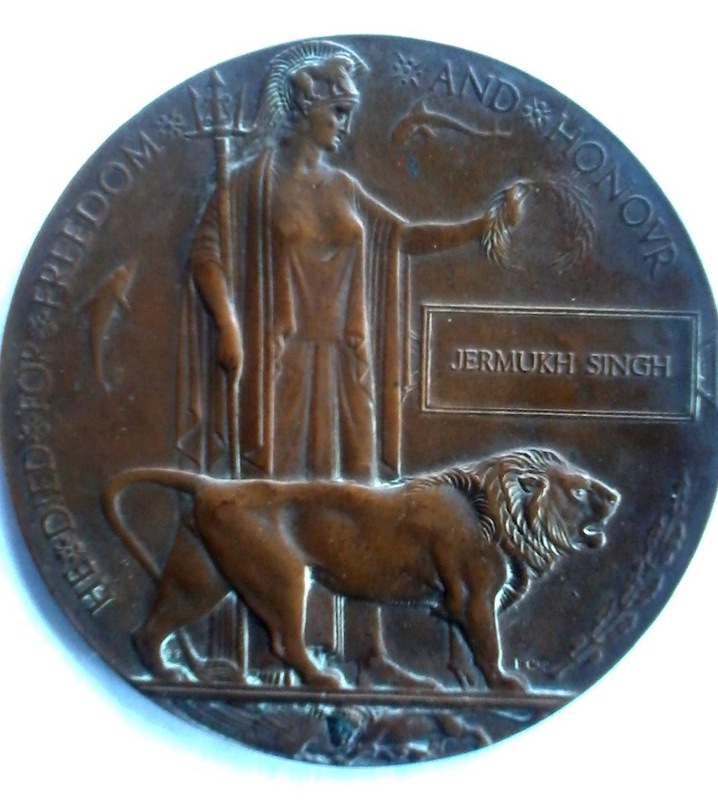 He was attached to the 14th Ferozepore Sikhs during the Great War and died in Basra, Mesopotamia on 26 October 1918. His life has been researched by his great-granddaughter, Citizen Historian Rani Brar. Gurmukh Singh, the son of Wir Singh, was born around the 1870s in the village Aklia Jalalka near Nabha in the district of Patiala, East Punjab. Gurmukh Singh enlisted in the military on 2 April 1892. 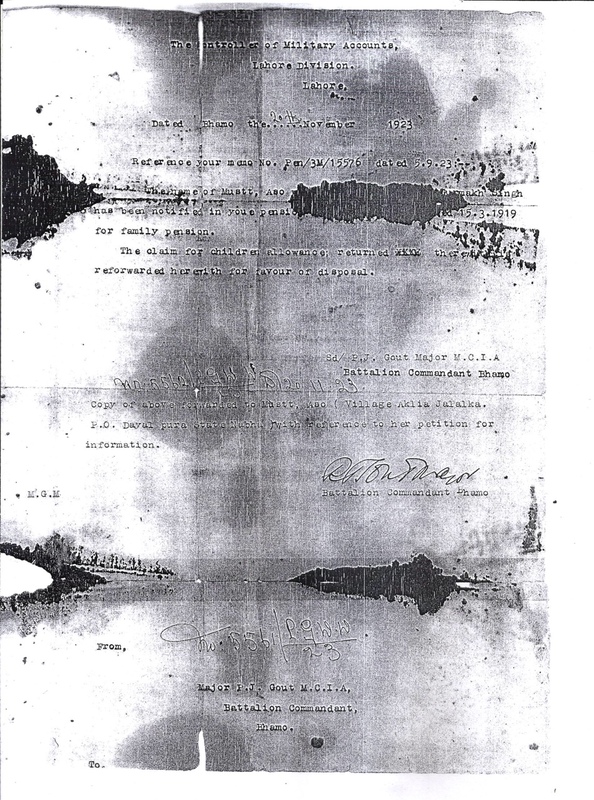 Based on the documents preserved by his family (see images), he appears to have joined the Burma Military Police, a semi-military force that supplied drafts to various regiments that had lost men in the Great War. It is believed he married Musamat (Lady) Aso before the war broke out. 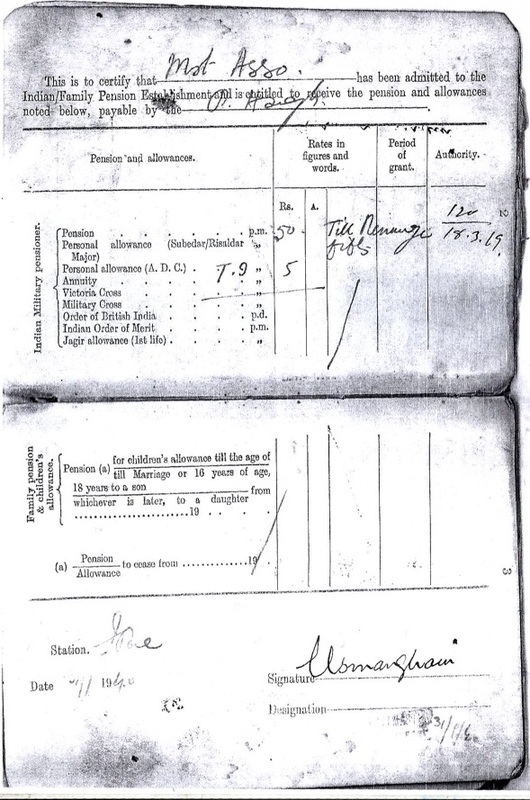 According to a document dated 25 June 1916 (see image), Gurmukh Singh was promoted to the junior infantry rank of Jemadar in the 15th Ludhiana Sikhs on 17 August 1915. The 15th Sikhs had suffered significant losses over a period of a year on the Western Front, and had been replenished with drafts from other regiments including the Burma Military Police. Gurmukh Singh's promotion came just a few days after the regiment was redeployed to Egypt. According to a certificate dated 8 September 1917 (see image), Gurmukh Singh was promoted on 1 April 1917 from 2nd grade Jemadar to 1st grade Jemadar in the Bhamo Military Police Battalion (a battalion of the Burma Military Police named after the town where its headquarters was located) to fill existing vacanies. Gurmukh Singh fought in the Mesopotamian Campaign with the 14th Sikhs. The Burma Military Police had supplied the 14th Sikhs with seven Indian officers, 496 other ranks and 4 followers (Colonel F.E.G. Talbot, 'The 14th King George's Own Sikhs: 1846-1933', London, 1937, p 157). It was possibly at this time that Gurmukh Singh had undergone professional training in the use of the Lewis gun and machine gun (see Indian Army List, October 1918). He was promoted to the senior infantry rank of Subedar on 11 January 1918. He died on 26 October 1918 when the 14th Sikhs were ordered to attack Mushak (Mushaq) during operations leading up the the Battle of Sharqat. A 'Subadar Gurmukh Singh (B.M.P.)' 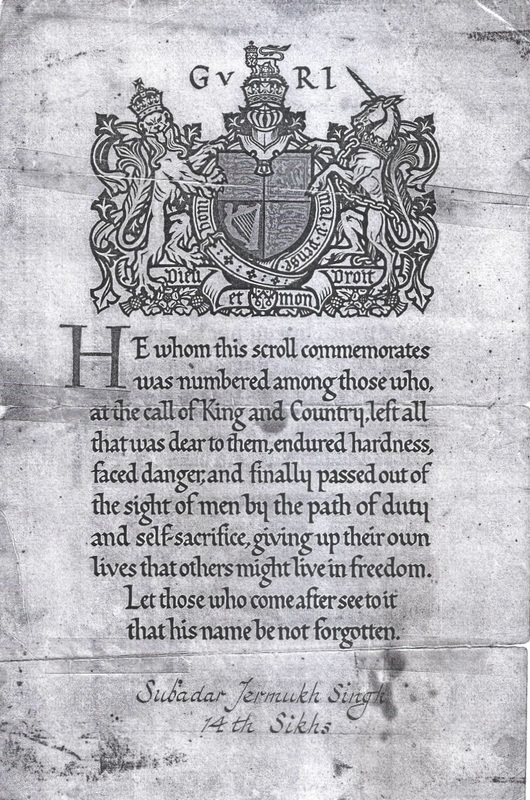 is listed in one regimental history as having been 'Killed, or Died of Wounds' in Mesopotamia (Colonel Talbot, 'The 14th King George's Own Sikhs: 1846-1933', p 157). He is commemorated on Panels 59 and 68 of the Basra Memorial. At 3 a.m. on the 25th of October the 51st Brigade continued' the advance with the Highland Light Infantry in the lead. By midday the Highlanders had made contact with the Turks in position just south of Mushak. The Sikhs were held back in reserve while the Gurkhas had advanced level with the Highland Light Infantry along the Jabal Makhul Ridge. It was thought that Mushak was held only lightly so the 17th Division was ordered to attack immediately while the 18th Division crossed the Little Zab river and pushed on northwards. General Cobbe's order did not reach the 17th Division until 5 p.m. and the Highland Light Infantry were not able to start forward until after dark. The Highlanders encountered strong opposition astride the road at about 8 p.m. They immediately assaulted and captured the post, but suffered very heavy casualties in the fighting. Two companies of the 14th Sikhs were sent forward to support the Highland Light Infantry, but were withdrawn at 10 p.m., when the position was consolidated. The 14th Sikhs bivouacked for the night in rear of the Highland Light Infantry. East of the Tigris one brigade had crossed the Little Zab river and was holding a position on the northern bank while the cavalry had also crossed the river some miles farther east. The artillery was having great difficulty in advancing up the west bank of the Tigris and only three field-howitzer batteries were forward with the 17th Division. It was thought that the Turks intended to retire from Mushak, so the 17th Division was ordered to push on and pursue the next day while the cavalry advanced north to cut off the Turkish retreat. The Turkish position at Mushak was very strong, especially the left flank near the river. On the west of the road there was a tangled mass of (precipitous hills, and the ground was quite flat between the river and the road. Since it was expected that the Turks would withdraw during the night the 14th Sikhs were ordered to move up on the right of the Highlanders and carry out a rapid attack across the flat ground east of the road. However, night patrols of the Highland Light Infantry reported that the enemy were still holding their positions in strength. The Brigade Commander, General Hildyard, decided that it was too late to change the plans and he ordered the attack to proceed as arranged. At dawn the 14th Sikhs deployed on the right of the road, with "A" and "C" Companies in the front line and "B" and "D" Companies in support. The attack was supported by eight mountain guns and the 403rd Howitzer Battery. The Regiment commenced to advance at 6.25 a.m. and almost immediately came under artillery fire. Although the Sikhs suffered casualties as they advanced over the open ground, they continued to advance in open formation. They soon came under machine-gun fire and platoons extended. There was little cover and the Regiment began to suffer heavy losses. The men continued to press forward very gallantly with great determination and in spite of increasing casualties, including three company commanders. Captain K. K. O'Connor had been reported killed early in the day, but he was brought into the aid post in the evening with a wound in his thigh. It transpired that during the first advance a bullet had penetrated the buckle of his Sam Browne belt and knocked him out. He had fallen on his face and had been left for dead. On recovering consciousness, seeing that his company had moved forward, he went on and was hit again in the thigh. By 7.30 a.m. the forward companies, which had been reinforced by "D" Company, had almost reached the enemy's wire and "A" Company on the left had joined up with the Highland Light Infantry, when they were held. Companies re-formed as best they could and. took up a line three hundred yards south of the enemy's wire, where they remained for the rest of the day. The 403rd Howitzer Battery had supported the Sikhs, but it had been put out of action by enemy artillery, while the mountain guns were having little effect on the enemy in their strong positions. It was quite obvious that the enemy was holding the position in strength and further progress by the Highland Light Infantry and the Sikhs was out of the question, while the Gurkhas on the left flank had also met strong opposition in very difficult country and could not make any more progress. General Hildyard, anticipating a Turkish counter-attack, sent two companies of the 114th Mahrattas to support the right flank, while the 112th Infantry secured the left and connected up with the Gurkhas. Meanwhile, General Leslie came forward himself to see the situation and decided not to attempt any further advance that day. ...In the ten days' fighting the 14th Sikhs suffered three hundred and fifty-two casualties, which was the highest number suffered by any unit in the Division. The end of the Mesopotamia campaign was followed almost immediately by the Armistice with Germany. The family received notice of Gurmukh Singh's death in a letter from Lord Stamfordham, Private Secretary to King George V, dated 10 December 1918 (see image). On 20 November 1923, Gurmukh Singh's widow, Musamat (Lady) Aso was granted a family pension of 55 rupees per month based on her husband's war service. Gurmukh Singh's family name was Gill. His son, Ranjit Singh (also a military man), died on 11 February 1952 aged 37 after an injury to his heart. There are no updates at present.